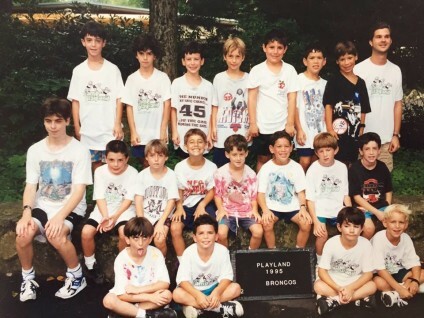 By Steve Bloom – I was a camper, and every summer I looked forward to seeing my camp friends. I loved my school friends, but my camp friends were special. These were faces I rarely saw during the school year, and they were the people that meant sunshine, swimming, sports, archery and fun. Michael Brown, Josh McGrath, Benj Ferri are names that still make me smile. I remember learning how to play the card game “Hearts” at summer camp. We would sit around a picnic table with one of our counselors, Uncle Danny, and play everyday after lunch. I remember our lap competitions, racing to see who could do the most laps in the swimming pool during free swim. We kept a chart by our cubbies. Prospective camp parents often ask, “Will my child be comfortable at camp if he/she comes without a friend?” or tell us, “I am nervous because my child will not know anyone.” I understand these concerns. It is scary to try something new alone, and even scarier for parents to picture their children in this situation. However, going someplace without a friend and succeeding is powerful. This is a tool a child can add to his/her social toolbox. Camp is a safe place where new friendships are formed everyday. Through shared experiences on the ropes course, in the swimming pool, on the athletic field, or playing cards, a camper will meet their camp friends.